Coda di Volpe is a grape that hails from the Campania region. There are both white and red grapes with this name, although the red is much more rare. I have had the white version often but have never tried the red version of this grape variety. Apparently, according to sources, Pliny gave the grape vine its name. Some say it was due to the color of the grape, others due to the shape. Here is a very involved explanation of the name from the blog, Fringe Wine, for those want to have a better understanding of its etymology. What is pretty much agreed upon is that this grape was first noticed during the Roman era. The grape itself, its “bianco” version, produces a light-bodied wine with nice fruit and floral aromas and flavors. It is seen in a number of Denominazione d’origine controllata (D.O.C.) wines such as those from the Campi Flegri DOC, Greco di Tufo DOC, Sannio DOC, Taburno DOC, and Vesuvio DOC. It prefers volcanic soils and is grown in the provinces of Benevento, Avellino and Caserta. I recently had this example from Terredora. 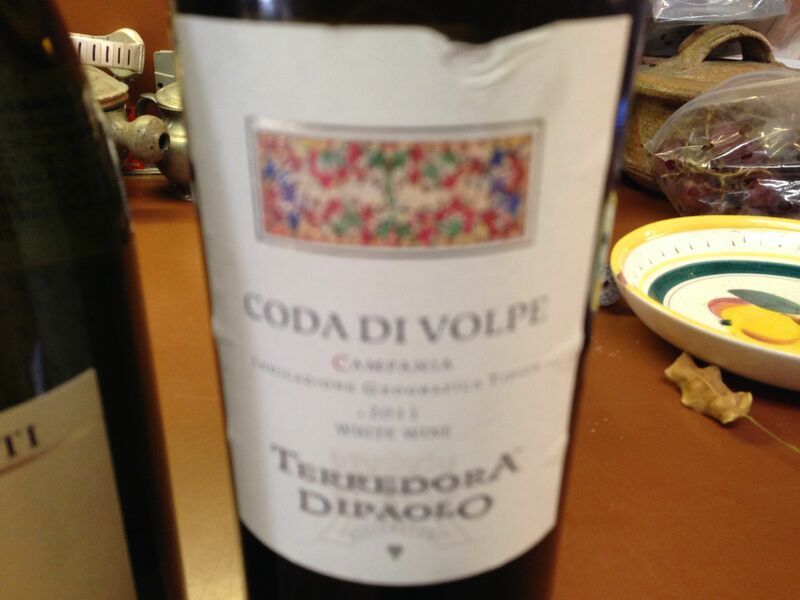 Other producers such as Donnachiara make Coda di Volpe as well. I know Illaria from Donnachiara but haven’t had the pleasure of trying her Coda di Volpe wines as of yet. Maybe next time I see her at VinoVip Cortina or Vinitaly. This wine tends to retail at anywhere between $14-$18 and pairs well with a variety of antipasti, cheeses, charcuterie, pastas, salads and fish. It can stand up to poultry but it is a bit too light for most meats in terms of its structure. Definitely a grape to try, especially for those who now see Greco di Tufo and Falanghina as old hat. Try another white from Campania. It is often blended but you can find it in its purest form as a single variety wine. I’m trying not to use the word mono-varietal which causes so much consternation in the wine community.